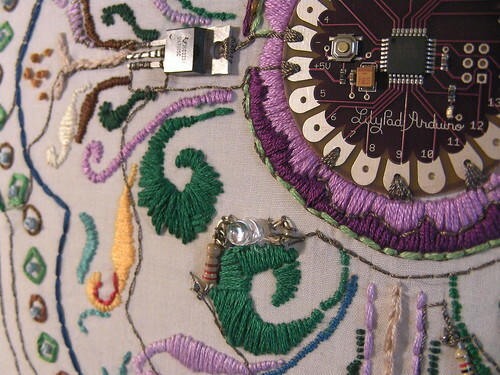 LilyPad Arduino Embroidery | F.A.T. I’ve been working with Leah Buechley’s LilyPad Arduino, and in true embroidery sampler fashion, have composed this circuit to see what I could do. The embroidery uses traditional floss and techniques mixed with lights and sounds generated by the onboard software. The amount of light sensed by the sensor changes the speed and pitch of the lights and sounds generated. Move your shadow or hand over it to experience the changes. Upcoming will be an exciting collaboration with Collin Cunningham to make it make more interesting sound. For the time being the circuit is open source inasmuch as the traces are visible on the surface of the embroidery. This piece narrowly evaded being lost in my luggage on the return flight from Maker Faire; at the last minute I decided to carry it on. More info is back at Sternlab. finally some wearable tech that doesn’t look awkward as hell! I like that the circuit is really integrated into the design.